During the NARA years, addicts who committed felonies but were deemed by judges to be good rehabilitation prospects were allowed to enroll in federal drug treatment programs to avoid going to prison. Typically, those admitted to these treatment programs were there for 18 months. Following another 18 months of monitored aftercare, the (hopefully) recovered addict’s record was expunged. An estimated 10,000 men and women took advantage of this program and avoided prison and criminal records. To illustrate how radical this change could be in practice, one member of this new support group in Lexington – whom I interviewed – avoided a lengthy sentence in lieu of treatment, despite the fact he’d shot a police officer while stealing a car. With these profound changes in law, The Narcotic Farm, overnight, ceased being a 1,500-bed prison and became a “treatment center” where art therapy supplanted job assignments and prison bars were removed from inmates’ windows to make way for patients’ beaded curtains. Along with a fresh new look arrived a staff of eager young psychiatrists who favored conducting group therapy underneath the half dozen pin oaks that dot the institution’s grounds. 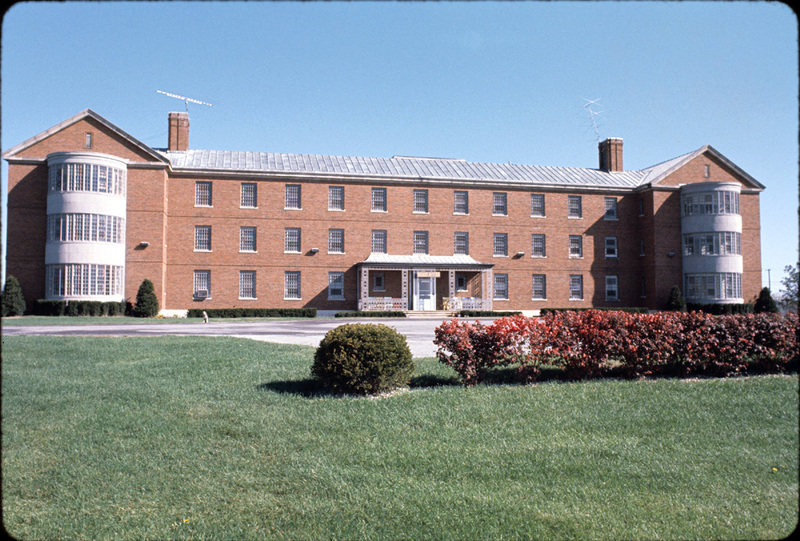 Meanwhile, inside the changing institution, five therapeutic communities with names such as “YOUnity House” and “Ascension House” sprang up, offering professional counseling and peer recovery support to NARA “clients.” For a brief period during the NARA years, the de facto policy of locking up drug users was over. Now the emphasis was on talking through one’s addiction as a means of ending it. These far-reaching changes in laws and public attitudes toward drugs were an anathema to old-time Narcotic Farm staff, particularly the guards, who pined for the old days and viewed the new ones with suspicion. These suspicions only deepened when Matrix House was announced. Unlike any of the other drug-free groups housed inside the institution, Matrix would be run like a back-to-the-land commune, one that would exist in a separate building a quarter of a mile from the main institution. There would be no staff and no guards. In this new experimental environment, it was reasoned, addicts would conduct treatment solely amongst themselves. Set up in a classic therapeutic community style of the time, Matrix was designed to run in a top-down hierarchical fashion. Also by design, it was to be led by a strong, autocratic leader, one who could direct the group’s intense therapy sessions while also living there. Matrix House, shortly before it was closed by the FBI. Discipline and hard work were major themes inside the house, and all interviewed describe their time at Matrix like one might describe a grueling bootcamp. In addition to demanding that residents submit themselves to their cause, Matrix was also isolated: other than a physician’s morning rounds, the few dozen men and women living there were left alone to go about their days and nights working feverishly inside a space initially built to hold 200 convicts. What had started as a collective sense of suspicion among old-time staffers turned to bells of alarm when it was revealed by Dr. Conrad that a former professional guitar player named Jon Wildes had been tapped to run Matrix House and serve as its director. This alarm came by virtue of the fact that Wildes was not only a recovering heroin addict, but had also been to The Narcotic Farm some years before after being arrested as part of a heroin ring in his home state of Florida. The exact circumstances under which Wildes was hired by Conrad remain unclear. 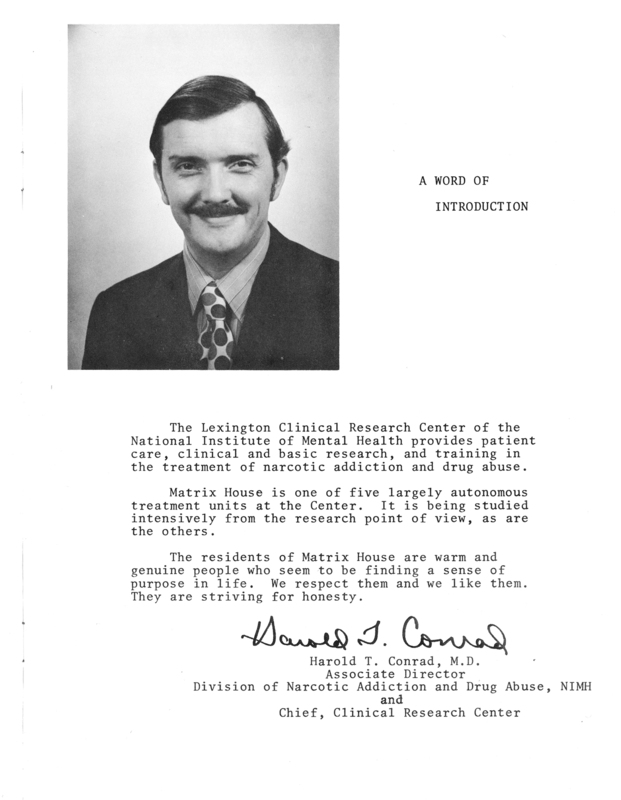 Harold Conrad, The Narcotic Farm’s Chief Medical Officer in Charge and an ardent supporter of Jon Wildes and Matrix House. However, documents show Conrad hired him with full knowledge that Wildes was a felon; in fact, this part of Wildes’ CV was used as a promotion of sorts for Matrix as it reflected well on the government’s newly enlightened policy on decriminalizing drug offenses. Wildes, however, was a man who returned to The Narcotic Farm with a distinctly checkered past. One written account I found at the Kentucky Historical Society, written by a former nurse at the institution, described Wildes as “untruthful, manipulative and conniving,” and at his core, narcissistic. While many within the treatment staff who knew-him-when viewed Wildes warily, it was the guards who seethed at the thought of him working as a federal employee. But even more outrageous to them was the fact that Wildes was openly gay. Matrix residents, however, saw Wildes differently. They were drawn to him. Even today some former residents speak of him with a sense of awe. Matrix House Director Jon Wildes, left, and his second in command, Jay Therrien. In my interviews with former Matrix House members, all described him as, initially, a hard-working and motivated drug counselor who was sincere in his desire to help Matrix residents maintain a drug-free life. One Matrix resident I interviewed even remarked that Wildes was what he’d imagined Oscar Wilde was like in his time – witty, talented, and immensely perceptive. It was an image that Wildes did little to dispel, at one point even dressing up as Oscar Wilde at a Matrix House costume party. But beyond his charming ways, residents were consistently impressed at his knack for working the levers of power to the group’s advantage. Moreover, they marveled at how this former addict was now traveling the country on junkets – often with Dr. Conrad accompanying him – as a kind of proselytizing ex-heroin addict and doctor team that was spreading the gospel of how this new drug treatment program was turning lives around. Matrix’s treatment model was based on Synanon, a group Wildes had been involved with after leaving The Narcotic Farm in the mid-1960s. 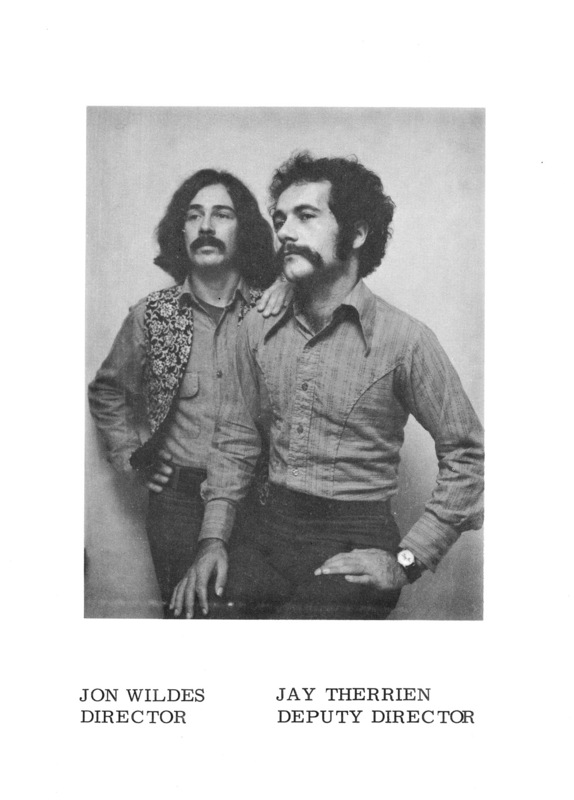 At the time the Santa Monica-based Synanon was a widely-celebrated drug-free group that boasted an impossibly optimistic 80 percent “cure rate” among addicts. Synanon’s success, said its supporters, derived from the fact that the group had perfected a new, exciting and confrontational form of talk therapy and community living that demanded participants speak with absolute, total honesty. Synanon was selling truth, and in 1970, the public was buying it up. The point of “The Game” was to chip away – through verbal confrontation – at an addict’s distorted sense of self, a self that’s seen by non-addicts as impulsive, ungrounded, and, above all, selfish. Once all pretenses were stripped away, conceivably, Matrix House would “rebuild” the person with positive reinforcement. Physical violence or threats of physical violence were not allowed in “The Game.” But virtually anything else needed to force honest discussions were encouraged and viewed by all there as therapeutic. One former patient at The Narcotic Farm who opted not to join Matrix after visiting it on a tour, left convinced that the residents’ therapy model was akin to playing with fire.